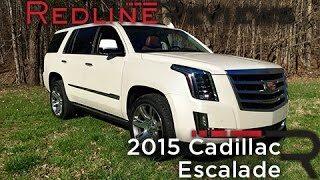 Cadillac has revealed the all-new 2015 Cadillac Escalade, a sophisticated luxury SUV designed to establish new benchmarks for hand-tailored craftsmanship and technology. 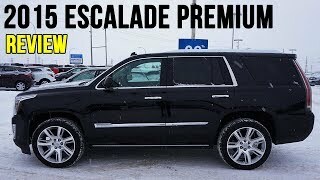 With is bold design, powerful capability and luxurious accommodations the Escalade has become the standard among luxury SUVs. 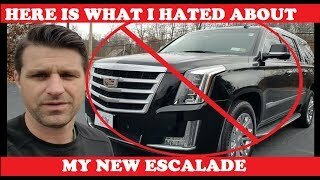 The new Escalade gets some sophisticated exterior features. The headlamps incorporate the industry’s first Total Internal Reflection LED high-beam function. Full LED lighting creates a bold new interpretation. It gets LED-illuminated door handles on the Premium Collection. It has a light aluminum hood and the liftgate panels reduce overall mass. On the rear it gets a rear wiper and a rear spoiler which give a clean appearance and improved visibility. 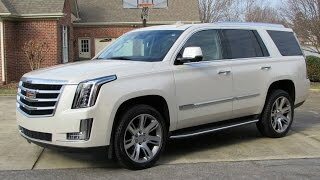 The Cadillac Escalade has one of the industries most authentic and luxurious cabin mixed with seamless technology. Real wood combined with premium cut-and-sewn materials and sueded accents, along with ambient lighting, are designed to add elegance to the interior design. The seats were designed to be more comfortable. Heated and cooled seats are standard in front and second-row bucket seats have standard heat. 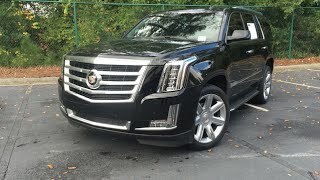 Offered with 2WD and 4WD drivetrains, Escalade features a new 6.2L V-8 engine rated at an SAE-certified 420 horsepower (313 kW) and 460 lb-ft of torque (623 Nm) – a nearly 5-percent increase in horsepower and 10 percent more torque. The engine is matched with the Hydra-Matic 6L80 six-speed automatic transmission with enhanced TapShift control.